Place butter in the bowl of a stand mixer. Using the dough-hook attachment, stir on medium speed, slowly adding the dry ingredients. Add water and continue to stir until dough forms. Remove dough onto a lightly floured surface; roll out with a rolling pin to 1/8” thick and cut to fit into tart pans. Place individual pieces of dough into tart plans and cover with parchment and baking beans. Bake in oven preheated to 350 °F for 15 minutes. Remove baking beans and parchment from the tart shells and spread the egg wash over all the tarts. Bake for 10 minutes longer and cool at room temperature. Combine eggs, sugar, lemon peel and juice in the top of a double boiler; place over bottom of double boiler filled with boiling water. (Note: water in bottom of double boiler should not touch the top pan). Cook egg mixture beating constantly with a wire whisk until it begins to thicken and ribbons form when whisk is lifted from the mixture. Add the butter, one tablespoon at a time. Once all of the butter is incorporated into the mixture, remove from the pan and refrigerate the curd. Remove tarts from pans. Add lemon curd to each tart shell. 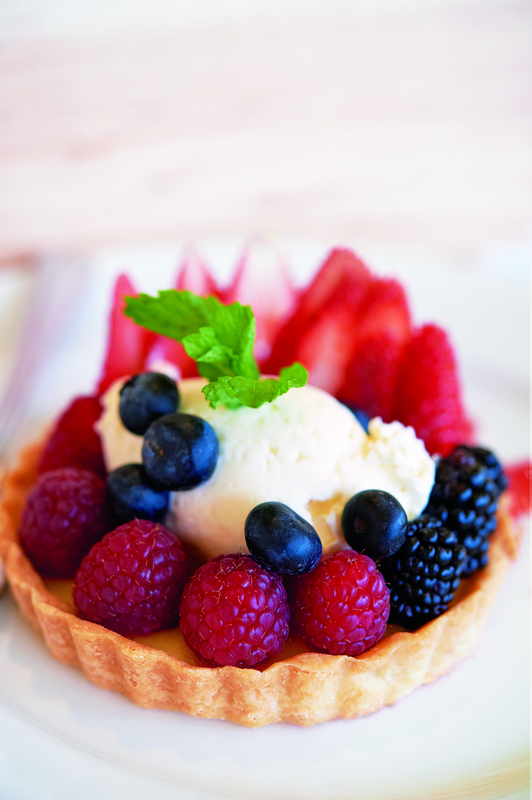 Sprinkle fresh berries over each tart and top with whipped cream.